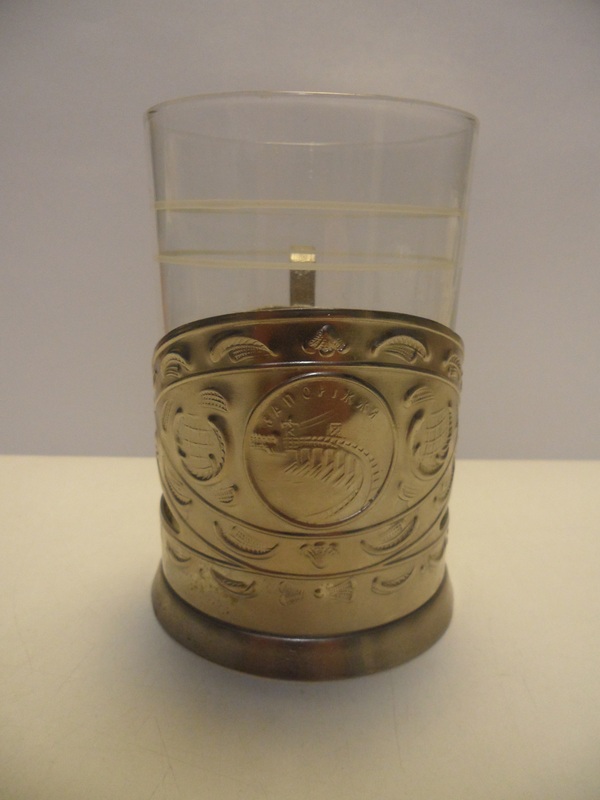 The first Friday object of the new year is a podstakannik (tea glass holder) which I bought in the Soviet Union during the 1980s. The picture on the front shows the Zaporozhye hydroelectric station. 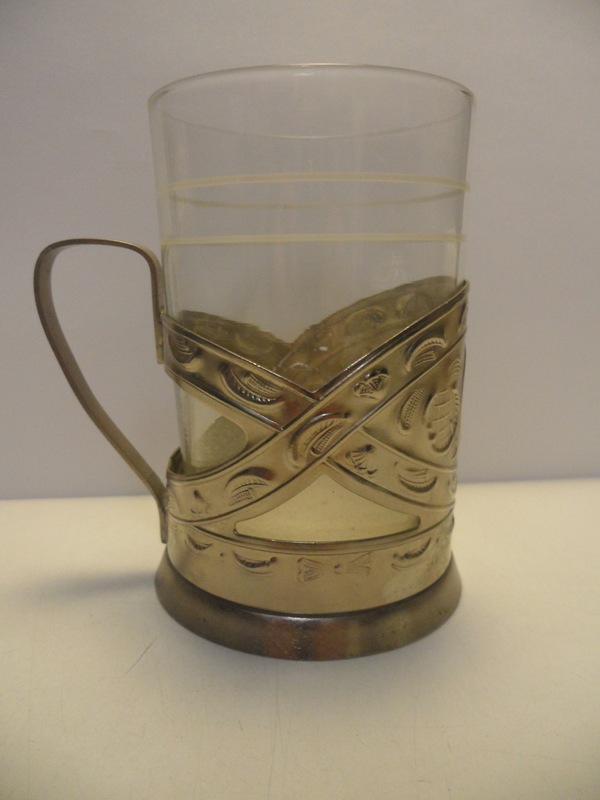 I symbolically raise it in a toast to you all for a happy 2015. Among the books waiting to be read on my bookshelf is A Sense of the Enemy: The High-Stakes History of Reading Your Rival’s Mind, by Zachary Shore. This caught my attention because fifteen years ago Shore lived on the same corridor as me at St Antony’s College, Oxford, while we were both writing our doctoral theses. Also, the subject matter fits well into my forthcoming course on Irrationality and Foreign Policy Decision Making. The book is a study in decision making, and judging from what I have skimmed so far, it advances a fairly simple thesis: successful foreign policy depends upon what Shore calls ‘strategic empathy’, that is to say an ability to understand what motivates your enemy. This does not mean imagining what you would do if you were in your enemy’s place. Rather it means really understanding them, their desires, the constraints under which they operate, and so on. I would take this further and say that strategic empathy is important not just when dealing with ‘enemies’ but in politics more generally, and that it is precisely the lack of such empathy which has pulled Russia-West relations into the mess which they are today. The response of both Russia and Western states to the crisis in Ukraine has been to throw insults at one another and to resort to conspiracy theories. To many in the West, Russian behaviour in Ukraine is the product of a deliberate plan of imperial expansion; to many Russians, the civil war in Ukraine is the result of a long-term American strategy to destabilize and weaken any potential rivals. Within Ukraine, the current government views the war as solely the consequence of Russian aggression, whereas the rebels view themselves as victims of government barbarity. No matter who you are, somebody else is entirely to blame. No effort is made to understand, let alone empathize with the other side’s point of view. Underlying all this is a sense on both sides of moral righteousness. The division of the world into good guys – us – and bad guys – them – discourages any effort to promote strategic empathy, for the latter comes to be regarded as appeasing evil. But strategic empathy does not require that one concede that the other side is right. Rather, through a better understanding of others’ actions, one increases one’s chances of pursuing successful policies. So, for instance, the government which came to power in Ukraine in February 2014 arrogantly ignored the concerns of those protesting against it on the grounds that they were simply stooges of Moscow and did not represent genuine public opinion. The result was civil war. The government would have done better to understand that some of its citizens did reject it and needed reassurance. Meanwhile, Western states failed to understand how important Ukraine is to Russia, and thus failed to understand how Russia was likely to react to the forcible overthrow of the Ukrainian government. Fixated on ‘Russian aggression’, Western leaders made no effort to understand the opinions of those fighting against Kiev. Consequently, Western leaders reinforced the inflexibility of the Ukrainian government, and so made a bad situation even worse. Russian leaders have also made mistakes. The annexation of Crimea incited the governments in Kiev and the West to see the events in Eastern Ukraine as a repetition of those in Crimea, and so to view the protests against Kiev as being not an expression of legitimate opinion but rather a precursor to Russian invasion. Russian actions instilled fear and encouraged intransigence. Moscow does not seem to understand this. If I have a blogging wish for 2015, then, it is for both Russia and the West to try harder to understand how the world looks from the other’s point of view. Moral certitude may be emotionally satisfying, but strategic empathy is far more likely to lead to peace. VISA and Mastercard announced on Boxing Day that they will no longer provide services in Crimea, on the grounds that to do so would be in violation of the latest sanctions imposed by the United States and its allies in Canada and Europe. These include a prohibition on the importation of goods from Crimea, a ban on companies providing tourism services in Crimea, and the outlawing of investment in Crimea. Is this sanctions policy rational? In January I will start teaching a course on ‘Irrationality and Foreign Policy Decision Making’. ‘Irrationality’ is somewhat hard to define, but one way of looking at it is in terms of ends and means. Actors who choose means which will help them achieve their intended ends may be considered rational. Actors who choose means which they know will not achieve those ends are irrational. So, what are Western nations’ objectives in imposing sanctions on Crimea and will the sanctions actually help them reach those objectives? It could be that the aim of the sanctions is to coerce Russia into giving Crimea back to Ukraine. The problem with this objective is that it cannot be achieved. Russia will not surrender Crimea. If Western states believe otherwise, they are deluded. If they understand that they cannot force Russia to hand over Crimea, but are pursuing this objective anyway, then they are acting irrationally. In any case, if the aim is to put pressure on Moscow, it seems strange to sanction Crimea. The effect of the sanctions will be to make life difficult for the inhabitants of the peninsula, but they won’t directly harm those in Moscow who make the political decisions. The means chosen do not match the apparent end. A rational person might, therefore, conclude that pressuring or punishing Moscow is not the aim after all. Perhaps the objective is instead to punish the people of Crimea. But that makes little sense. In the first place, the sanctioning states do not gain any benefit from such punishment. Second, Western states have never blamed the people of Crimea for the annexation of the peninsula, and so punishing them would be odd. Perhaps, then, the sanctions are not really meant to achieve anything as far as Russia is concerned. Rather their purpose is to satisfy domestic public opinion. The problem with that explanation is that the public in most Western states doesn’t seem very interested in Crimea. Outside of Canada there isn’t much of a Ukrainian lobby pushing for a harder line against Russia. It’s not obvious that there are domestic political interests which need to be appeased, and thus it does not appear that there is any political benefit in sanctioning Crimea. Another possibility would be that the policy is a product of bureaucratic inertia. Following the annexation of Crimea, committees were formed, papers written, and processes started. Now they are ploughing their way forward regardless of whether what they are doing serves a meaningful purpose. And yet another possibility would be that Western political leaders don’t actually know what their objectives are, but are flailing around blindly in order to satisfy their own personal sense of moral outrage. The rationality in this case would be personal and emotional. If so, it is impossible to verify. All in all, it’s hard to explain what is happening using a rational actor model of policy making. One has to look elsewhere for an explanation. 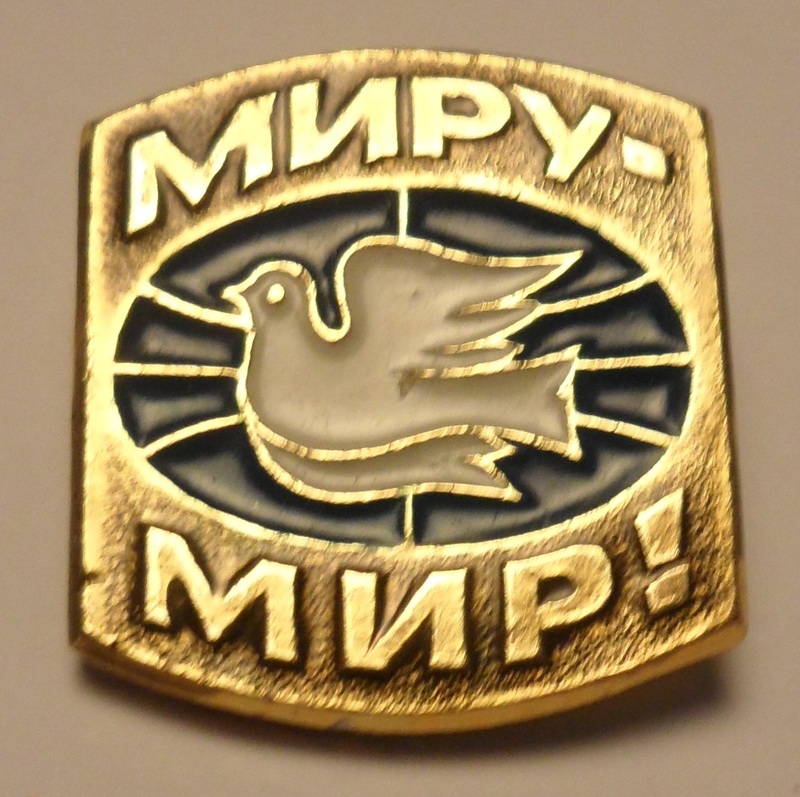 The last Friday object for this year is a little badge I got in Minsk in 1987. ‘Peace to the world’, it says. Amen. But Canada is not the only country claiming the Pole. In the past 12 months, journalists, politicians, and academics alike have leapt with zeal on the ‘Russian aggression in the Arctic’ bandwagon, referring often to a 2007 incident when Russian scientists planted a titanium Russian flag on the seabed beneath the North Pole . ‘Russia Is Trying To Bully Their Way Past Canada Into Arctic Sovereignty’, pronounced Vice News in January 2014. ‘Russia’s aggressive gambit to seize territory in Europe has amplified the need for Canada to fortify its claims to potentially disputed territory in the Arctic’, said Professor Aurel Braun of the University of Toronto in September. ‘Since Mr. Putin returned as President of Russia in 2012, but particularly in the past year, Russian claims to the Arctic have multiplied’, he added. In any case, Russia isn’t the competitor that Canada really has to worry about. In early December this year, the Danish government submitted scientific data to the UN in support of a claim to the North Pole, on the grounds that the Lomonosov Ridge under the Arctic Ocean is an extension of Greenland’s continental shelf. Experts suggest that the Danish claim is much more credible than those of Russia and Canada. ‘Preliminary work has shown … that Denmark would actually have the strongest claim to encompass the North Pole within its region,’ Ron McNab, formerly of the Canadian Polar Commission, told CBC News. Santa, it appears, is probably Danish. Ho, ho, ho! In his speech to the Russian parliament on 4 December, Vladimir Putin quoted philosopher Ivan Ilyin, who died 60 years ago today. Putin supervised the repatriation and reburial of Ilyin’s body in 2005, and has laid flowers on Ilyin’s grave. He has quoted him several times before. Ilyin’s Our Tasks (Nashi Zadachi) was one of three books distributed by the Kremlin as recommended reading to regional governors and senior members of the United Russia party in early 2014. And on December 22nd of this year, members of the Duma, Federation Council, and Presidential Administration will meet in Moscow for a round-table discussion of his work. If Putin has a favourite philosopher, Ilyin seems to be the man. So who was he and what did he believe in? Born in 1883, Ilyin studied law at Moscow State University and completed his thesis The philosophy of Hegel as a doctrine of the concreteness of God and humanity in 1916. Resolutely anti-communist, he was expelled from Soviet Russia in 1922 along with some 200 other intellectuals on the infamous ‘philosophers’ steamboat’. He then took up residence in Berlin, where he made contact with members of the exiled White army of General P.N. Wrangel, who nicknamed him Belyi (White) on account of the pure belizna (whiteness) of his opinions. Ilyin became the unofficial ideologist of the White Army in exile, and much of his work thereafter was as much political as it was philosophical, and was aimed at a wider audience than other philosophers. Ilyin’s work covered a large variety of subjects, including the philosophy of Hegel, law, politics, the ethics of violence, the nature of the Russian nation, and the tasks incumbent on Russian émigrés. He was in many respects a religious philosopher, in that he regarded spiritual matters as more important than material ones. 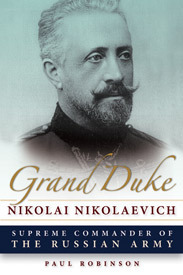 He believed that the Russian revolution was a product of the spiritual failings of the Russian people. Russia’s resurrection depended on the revival of the correct spirit, including a love of God, a love of Russia, respect for the law, a sense of duty and honour, and devotion to the state and the common weal rather than personal or party interests. It is difficult to reduce the writings of such a complex thinker to a few lines, but three themes stand out: gosudarstvennost’ (statehood); pravosoznanie (legal consciousness); and natsionalizm (nationalism). Gosudarstvennost’. Ilyin was a firm believer in a strong state. Gosudarstvennost’ can be viewed in purely descriptive terms as meaning the system of government, but it is also a value-laden term. It implies a belief that the interests of the state should come first. In this sense it can be contrasted with obshchestvennost’, which is often translated as ‘public opinion’ but more accurately describes the liberal stratum of Russian society and its beliefs, and it can be contrasted also with partiinost’, the ideology of the Communist Party, which placed the interests of the party first. Ilyin believed that to view the state as a balance of competing material interests was profoundly mistaken. The state should work for the general good. To this end, it must be strong. In Russia, a weak state would result in anarchy. ‘Russian state power will be strong, or it won’t exist at all’, he wrote. Ilyin rejected federalism and demanded a unitary state, ‘dictatorial in the scope of its powers.’ He favoured autocracy, but one filled with ‘creative spirit … a dictatorial-aristocratic-democracy.’ The state should be absolute in those areas in which it had competence. But it should not have competence over everything. ‘At the head of the state must stand a single will,’ he wrote, ‘It cannot and should not regulate everything. The totalitarian state is godless.’ The state had to be bound by law and accountable to the people. Natsionalizm: Ilyin was a nationalist. Love of country was a central part of his philosophy. Russians he felt, should put Russian interests first. This contrasted with the internationalist philosophy of the communists. Furthermore, every nation, Ilyin said, should develop in its own way. Thus the West had no right to tell Russians how to run their own country; conditions in Russia weren’t the same as in the West. ‘Western Europe, which doesn’t know Russia, has not the slightest basis for imposing any political forms whatsoever on us,’ Ilyin declared. At the same time, Ilyin’s vision of Russia was as a multi-national empire. He did not believe that every small nation had a right to self-determination. Ukrainian independence was anathema to him. But, precisely because Russia was a multi-national country, and precisely because each nation should develop in its own way, Russians should not seek to assimilate the minorities within the country but leave them to develop their own culture. Although Ilyin initially hoped that the Nazis would prove to be allies for the Russian exiles against the Soviet regime, he was soon disabused on this notion and fell foul of the Nazi authorities after refusing orders to include anti-Semitic propaganda in his lectures at the Russian Institute in Berlin. In 1938 he fled Germany for Switzerland, where he lived the rest of his life, dying there in December 1954. 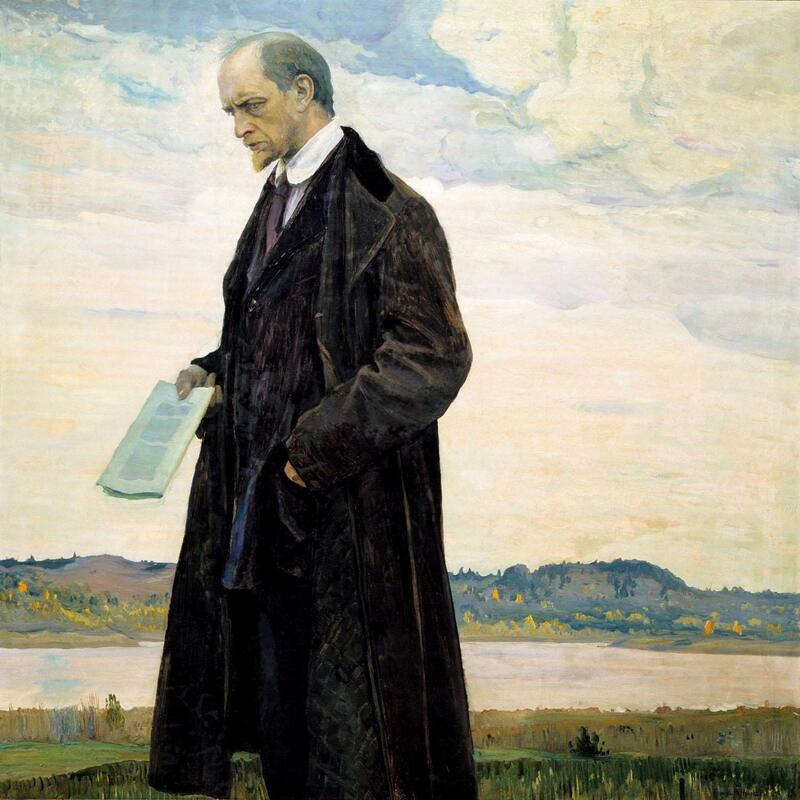 December 22nd will be the 60th anniversary of the death of philosopher Ivan Ilyin. I will post more about him on that date. 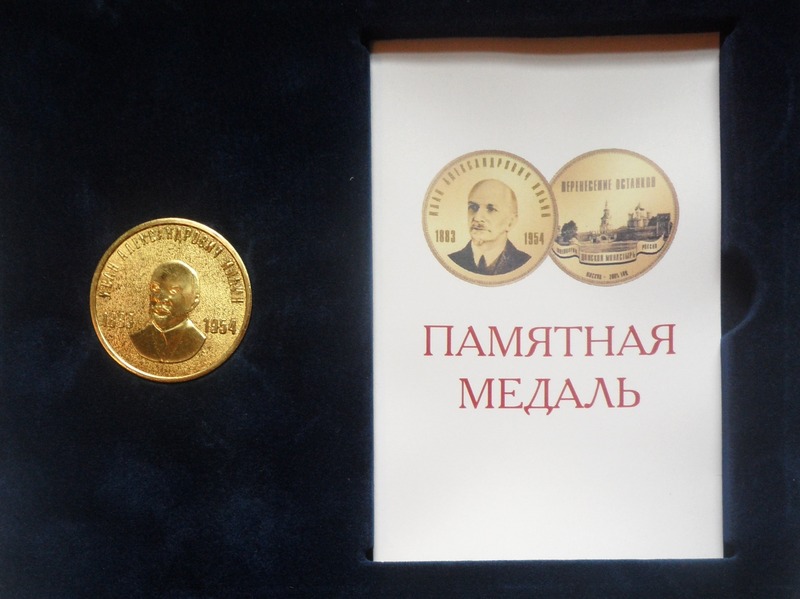 In the meantime, this week’s object is a commemorative coin I received when I attended Ilyin’s reburial at the Donskoi Monastery in Moscow in 2005. I wrote an account of the event for The Spectator, which you can read here.